The Beijing Olympics were supposed showcase China’s modernity, and Michael Phelps’ record breaking run for eight gold medals, but one man overshadowed everything. In one of the most extraordinary athletic performances in Olympic history, Usain Bolt of Jamaica smashed the world record in the 100 meter dash, without even trying. Having set the world record of 9.72 seconds earlier in the year, Bolt blazed across the finish line in 9.69 seconds, while slowing to celebrate the final twenty meters. This premature deceleration led many to question how fast he could have gone had he not slowed. Based on these calculations of Usain Bolt and silver medalist Richard Thompson, a mathematical representation of the race is determined. Bolt and Thompson began the race evenly, however, Bolt reaches a higher speed about four seconds into the race (Eriksen et al, 2008). Assuming that Bolt matches Thompson’s rate of deceleration through the latter stages of the race, rather than the rapid deceleration that occurs when Bolt begins to celebrate, it is possible to estimate a projected time had Bolt continued to sprint all out. Using a variant of the equation below, it is possible to determine Bolts speed had he continued the race at a pace equal that of Thompson. If Bolt met these conditions, based on these calculations he would have ran 9.61 ±0.04 seconds for the hundred meter dash (Eriksen et al, 2008)! Figure 3: Usain Bolt blazing by (http://gojumbos.com/cblog2). tailwind of this speed would decrease a 100 meter dash time by 0.10-0.12 seconds at sea level (Mureika, 2001). Altitude, or rather air resistance, has an affect as well. For every 1000 meters in elevation gain, sprinters can expect a 0.03 decrease in time (Mureika, 2001). Given that Bolt is a young (21) runner with room to improve his reaction time at the start and other possible variables, a future time under 9.5 seconds is not inconceivable. and t is an individual's maximum speed. “ ‘A big wheel is going to turn over slower than a small wheel, and it used to be thought that was a disadvantage except now when you see this guy who has the turnover of somebody six feet,’ Boldon said. ‘Add that to the fact that he's probably covering three or four more inches with every stride and that he's only taking 40 to 41 strides to finish a 100, and you cannot argue with the math.’ Boldon said he and the former 100-meter record holder Maurice Greene, who are both 5-foot-9, used to finish their races in between 45 and 46 strides. Tyson Gay and Asafa Powell, Bolt's top current competition, are at about 45. Carl Lewis required between 43 and 44 a t his fastest.” (Clarey, 2008). Bolt is able to take longer strides at a equal or faster rate than his opponents, leading to his superior 100 meter dash times. At any rate, clearly Usain Bolt is a special athlete, and world records from the 100 meter dash to the 400 meter run are in jeopardy for the next five or six years. 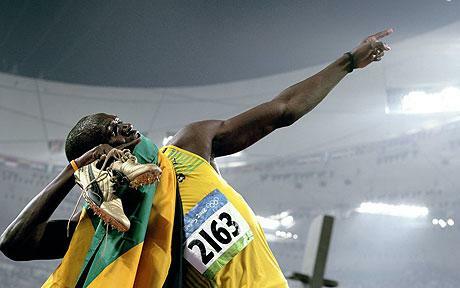 Figure 4: Bolt is aiming for more (http://www.telegraph.co.uk/). -Eriksen, H.K., J.R. Kristiansen, O. Langangen, and I.K. Wehus. "Velocity Dispersions in a Cluster of Stars: How Fast Could Usain Bolt Have Run?." American Journal of Physics 02 Sept 2008 03 Dec 2008 . -Wagner, Glenn. "The 100-meter dash: Theory and experiment." The Physics Teacher 36. 3Mar 1998 144-146. 3 Dec 2008 .